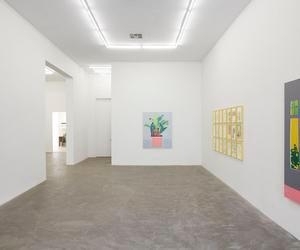 Praz-Delavallade Los Angeles is pleased to present its first solo exhibition by Guy Yanai, opening on November 4 and on view through December 22, 2017. Yanai’s practice is fueled by fables, stories and hymns—each painting a reflection of the pragmatic side of our life. In his isolated moments one may find a smiling child, a big splash, lonely banana, bristling cactus, modernist lamp, a singing bird or a tiny boat gliding on placid waters below a clear sky. These individual vignettes bleed into one another and could continue forever, suspended in time. Many of Yanai’s subjects are intentionally recognizable and commonplace, rendered into a pixelated appearance. For his exhibition Barbarian In The Garden, Yanai presents a series of paintings and drawings that capture his alienation to memory and places, flattened and made shallow through solid blocks of color that create the appearance of cut-outs or collage. He creates a mise en scène by the activations of separate vignettes from distant memories such as a painting of George Washington on a horse—drawn from a recollection of when he made a similar drawing for his brother around the age of 7—juxtaposed with paintings of plant life, unoccupied interiors such as a view from his apartment in Tel-Aviv or a hotel in Rayol-Canadel-sur-Mer. Influenced by impressionist masters such as Matisse and Cézanne, as well as contemporary figures like Tal R and David Hockney, Yanai’s personal style mixes the aesthetics of his transcontinental childhood spent between Haifa, Israel and the suburbs of Boston, where he first drew inspiration from scenes of everyday life. In his paintings, the banal is reduced to geometric segments where he then abandons references to the tangible world in favor of a visual experience that is more akin to digital imagery – such as a painting of Palermo as seen through Google Street View. Yanai shares in a similar dialogue with his contemporaries through the practice of translating visceral and visual experiences that are inherently embedded in the digital. Though many artists share a comparable approach in portraying the painted subject, Yanai works within a different cognitive space; He paints with fine and calculated brushstrokes in an existential manner, with every mark laid down through a detailed application, keeping layering to a minimum. His work can be seen in line with that of Robert Ryman or Philip Guston in his delicate handling of paint, where every stroke is critical to the work’s success. The vivid brightness of his palette reflects the warmth and light of his native land, while his interiors are placeless puzzles and his plants are almost always alone. The more time spent with Yanai’s painting, the more it encourages an investigation into the perceptive space of the canvas, a place where objects, scenery and nature are conjured, sustained and gently teased away. Guy Yanai (b. 1977, Haifa IL) attended Parsons School of Design and the New York Studio School before receiving his BFA from Hampshire College, Amherst MA. He has been included in numerous exhibitions nationally and internationally at institutions and museums including The Painting Center, New York City US; the Velan Center for Contemporary Art, Turin IT; the Ashdod Museum of Art, Ashdod IL; and the Haifa Museum of Art, Haifa IL.